At a time when the news about the environment saddens us, I wanted in this artwork to convey metaphorically some good aspects about how many people are caring for the world around them. In this piece, I convey how precious this species, the black and white Carnaby cockatoo, has become in Western Australia, and some of the efforts being made to provide these creatures with valuable habitat in and around the Piney Lakes reserve of Melville, in Perth. 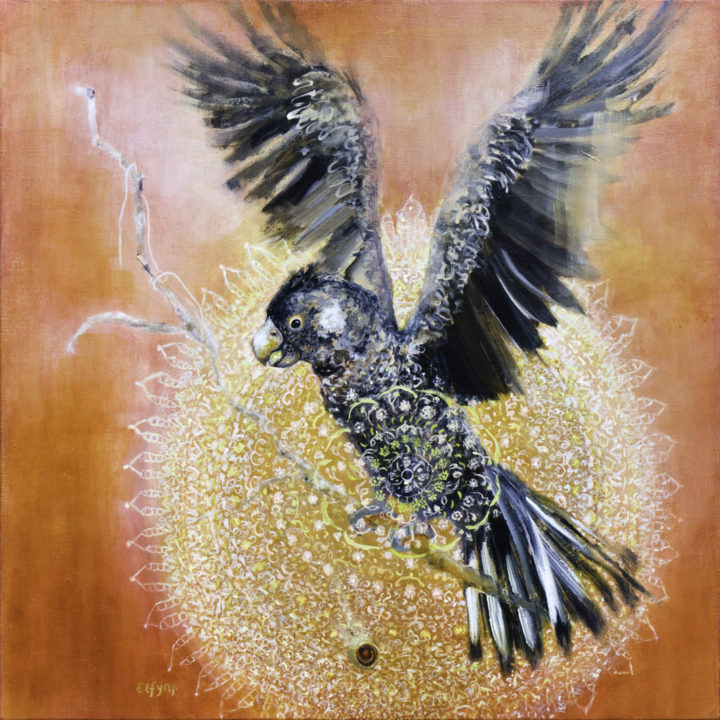 In this artwork, a marri nut falls to the ground, and the Carnaby is set against a shield or mat which is interwoven with marri nuts, eucalyptus leaves, and hakea flowers, symbolising its habitat. The artwork is inspired by Simon Gilby’s Pine Moth sculpture, hanging in the pine trees, in the Piney Lakes park. The Pine Moth has angel-like wings, and as I revere the Carnaby, I felt the angelic pose of the bird, and title, Pure Gold, apposite. © Elfynn. Copyright is reserved on all paintings on this site created by Lynda Fynn Dickinson ("Elfynn"). The use of any image from this site is prohibited unless prior written permission from the artist is obtained.